Warmer weather is upon us. Spring is the PERFECT time for gathering friends and family for entertaining and backyard barbecues! Unique Companies recently became an authorized Lynx dealer and we’d love to spread the word about this “luxury class”product we are now able to offer to our clients. Lynx is recognized as an ultra-premium outdoor kitchen brand with demonstrably superior quality, performance and design characteristics. • Lynx products are designed and manufactured in Los Angeles, California. Made in the USA! • Blue LED lights light up control knobs and internal lights light up the grilling surface. No more grilling in the dark! 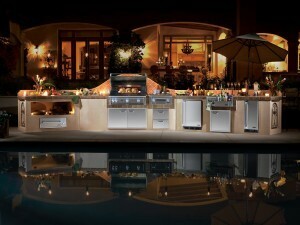 • Lynx is the ultimate in luxury outdoor kitchen products, it’s all they do! Is your current grill in need of replacement? Contact us regarding replacing or upgrading your current outdoor grill.